It's interesting that many bands originally playing doom-death have since transcended the genre, creating music that is more and more progressive and experimental but still retains the roots of doom-death. Anathema, My Dying Bride, and even Opeth have stretched the limits of the genre. 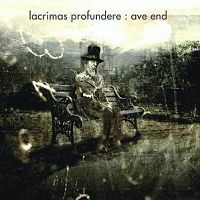 Like Katatonia, Lacrimas Profundere (which means 'intense tears') continues to tap into the gothic metal subgenre. Whereas Katatonia has embraced darkwave, Lacrimas Profundere leans more toward the style of Type O Negative, particularly with its basement-level vocals and minimalist musical vistas that can suddenly surge with overstated vibrancy. The centerpiece of the band is vocalist Christopher Schmid, who can tap into the low notes much like Peter Steele of Type O Negative, but who also has a more mournful croon that sometimes breaks down and sounds a little like Rozz Williams of Christian Death. Guitarists Oliver Nikolas Schmid and Christian Freitsmiedl prefer the higher octaves, their dual assault punctuated by harsher rhythms blended with restrained riffs and brackish solos. Bassist Daniel Lechner uses his instrument as a thumper, forcing the four strings to fill out the low end. Drummer Willi Wurm (Darkseed) keeps the percussion light and keyboard player Christian Steiner keeps his stings restrained. All facets of gothic metal are on display in Ave End, from traditional melancholic compositions such as Sarah Lou and One Hope's Evening to more upbeat darkwave numbers such as Amber Girl(which even has hints of Gary Numan in it) and Astronautumn. Lyrically, the band deals with the topics of obsession and death. Many of the tracks dance with death, treating it as seductress, drug, and excuse. The words are powerful and emotional. Here's a sample from the Astronautumn track: "Dust is all that we have in our hands/ Be lost not found but it's all never now/ When we are fixed then we are over/ Before we're there/ Say goodbye." Listen to this one on an overcast or rainy day: you will not be disappointed.